Windows 10 is a versatile, secure work platform designed to provide the same user experience across multiple devices. It is the ideal operating system for companies with a dispersed or mobile workforce. Windows 10 brings back the desktop and start button, which was a popular feature of Windows 7. However, Windows 10 enables you to customise your setup to suit your personal preferences. Windows 10 features a voice-activated, personal digital assistant called Cortana, which is built into the operating system. Cortana helps you find files, remember appointments and search the Internet, for example. Windows 10 adapts to whatever device you are using from desktop to mobile. To make the transition between devices seamless, Microsoft introduced a new type of software called Universal Apps for email, instant messaging and calendars. Windows 10 makes it easy to organise your work environment by creating multiple virtual desktops that you can switch between. Windows 10 comes equipped with Microsoft Edge Internet browser. Edge is fast, intuitive, secure and fully integrated with Cortana for voice-activated, intelligent search. 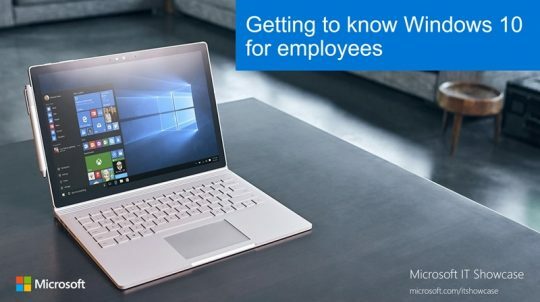 Windows 10 comes with excellent security and data protection while ensuring your documents, presentations and spreadsheets are always available when you need them. Windows 10 continues to evolve with new features and upgrades released periodically.